Since its introduction in 1981, the MTV logo has remained an iconic symbol of a company that redefined the way generations accessed music and pop culture. The logo evolved through several iterations, eventually becoming a more simplified version of the original wild and colorful variations originally used. Trends in the industry demanded the next generation of the MTV logo and the organization used an opportunity to produce business cards as a way to creatively express the logo again – this time as a window into the individual personalities of employees. 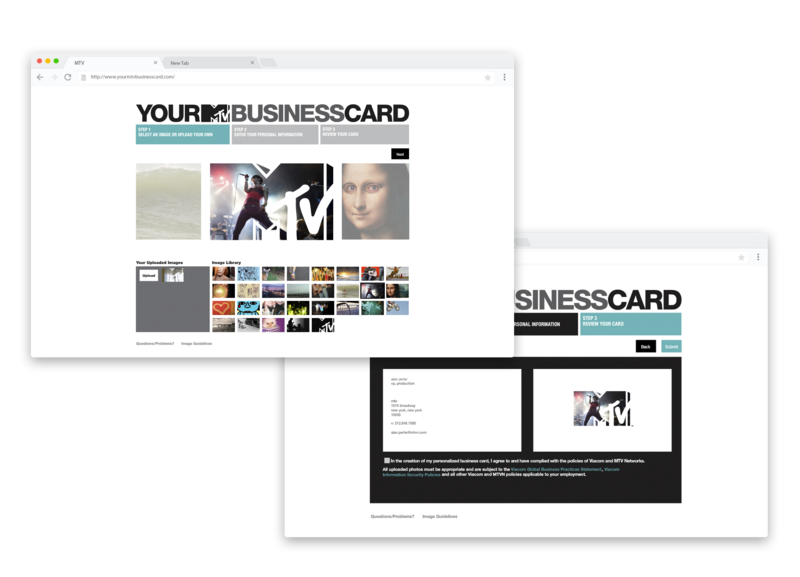 As the Your MTV Business Card lead, I guided a multidisciplinary creative team of designers, writers, and project managers while partnering with internal website developers to concept, build, and refine an end-to-end user interface across a unique website. The resulting site allowed MTV employees to customize their own MTV logo on their business cards with original or provided images that expressed their unique personalities and interests. It created engagement, excitement and built buzz through a simple and intuitive interface. The cards were then printed and sent out to individuals. More than 700 employees used the site which promoted individualism, artistic expression, and brand belief. The creation of hundreds of distinctive MTV logos generated by employees expressed unique personalities while still remaining faithful to the highly recognizable MTV logo and brand identity. The project was extremely well-received and recognized with a Webby and an AIGA award.